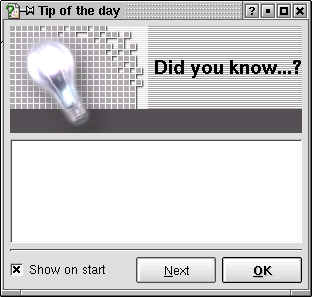 Mon Aug 12 2002 20:16: People come up to me on the street and ask me "Leonard, what's the most useless dialog box in the world? It would have to be one of those 'tip of the day' boxes, right?" And I say "Yes, strange person coming up to me on the street for no real reason, you are correct." And then I point them to the world's most useless dialog box, which I found while trying to get a KDE RSS reader to work.